Good location Good sized 3 bedroom apartment the kitchen is well stocked. The pool and spa are lovely and heated, improvement with some shade as there was nowhere to sit with our 3 month old out of the sun. There are no screens on windows or balcony door, some mosquitos but we had a great time. Loved the beautiful views and apartment! The beach across the road is beautiful. Just like smashed avo and binge-watching TV, travel is one of the best things in life. 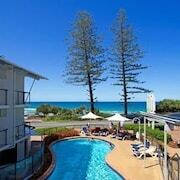 And if your travels take you to Coolum Beach, you'll discover a seriously awesome range of hotels to pick from. Let’s be real — who doesn't want to stay in the thick of the action? 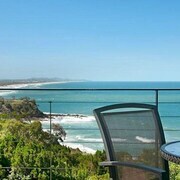 Lucky for you, there are 21 hotels within 5 kilometres of Coolum Beach's centre on lastminute.com.au. Keen to have a couple of big ones of the town? It doesn't get any more central than the Coolum Caprice and the Coolum Seaside! The Seachange Coolum Beach and the Element on Coolum Beach also have some wonderful facilities and amenities. There are 15 places to crash in Sunshine Coast Airport, which is 8 kilometres from the centre of Coolum Beach. To live it up here, look into The Sebel Twin Waters and Sand Dunes Resort. 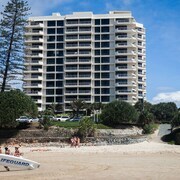 Marcoola Beach, 6 kilometres from the centre, is another pleasant neighbourhood. It has 10 available options. The best of the bunch here are the Ramada Marcoola Beach and Sunshine Coast Airport Motel. If you're a golfing fan, organise a game or two at Palmer Coolum Resort Golf Course. The most awesome news is you can stay just a stones throw away! 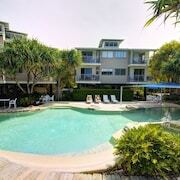 The Point Coolum Beach and Coolum Beach Getaway Resort are a couple of fabulous accommodation options nearby. 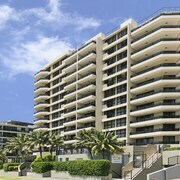 You might also like to try the Oceans Mooloolaba or the Fairshore Noosa. 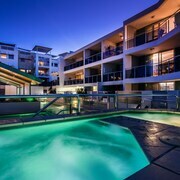 The Oceans Mooloolaba is 17 kilometres away from the centre of Coolum Beach, and the Fairshore Noosa is 16 kilometres away. 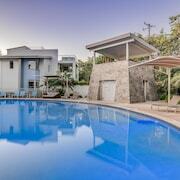 We'd also suggest the Spicers Tamarind Retreat and the Netanya Noosa. The first is 30 kilometres away from the center, while the latter is 16 kilometres away. Looking for more things to do? Spend some time exploring the Peregian Golf Course and Aqua Fun Park. You'll find them in Verrierdale, 11 kilometres to the northwest of Coolum Beach. 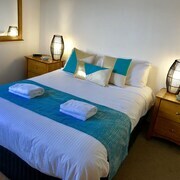 Verrierdale hotels and accommodations are the Noosa Edge Nudist Retreat and Kingfishers Manor @ Noosa. 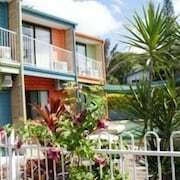 11 kilometres to the northwest of Coolum Beach you'll find Doonan, which is home to the Noosa Country House and Noosa Valley Manor B&B Retreat. The Noosa Springs Golf Club and Noosa Marina are up there with the most popular sites to see for those visiting Doonan. Pooped from the flight? Need somewhere half decent to kip but think 95 kilometres from Brisbane Airport to the centre of town is just a bit too far? Don't stress. The Novotel Brisbane Airport is super close and has your name all over it!